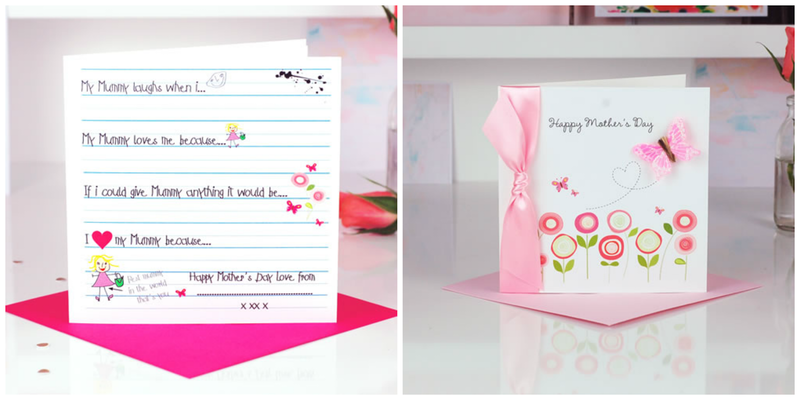 I have recently received these lovely Mother's Day cards to review by an online company called Made With Love Designs. They arrived securely in cardboard packaging and wrapped in tissue paper. Once, the tissue paper came off, I was immediately drawn to the white pearlescent finish used on the card with the child drawings on and the quality and thickness of both, was very good. The card with the child style writing on is particularly unusual, because it is meant as a keepsake card for mummy. There is space for the child to write their answers to the questions, then mummy keeps the card forever. The cards are printed with wax inks and are a little bit more special than normal shop bought cards. I like the hot pink envelope, but there is also an option to pay extra and receive a lined card presentation box instead. The card with the ribbon is really beautiful. The detail on the butterfly is also gorgeous and is handmade from feathers with a sprinkle of glitter. It is really pretty. The satin tied bow adds to the luxury edge of the card. Each card is handmade in the uk, to your specifications and it is possible to personalise the cards for £2.00 extra for 3 lines of text. The inside of each card, is left blank for your own message, but again, this can be personalised, if you wish. The price of these cards is £3.50 for the keepsake card and £4.50 for the embellished one. Next day delivery is available, if ordered before 4 p.m. There is a terrific range of Mother's day cards and gifts available over on their website. We received 2 Mother's Day cards to review. All opinions are honest and my own.